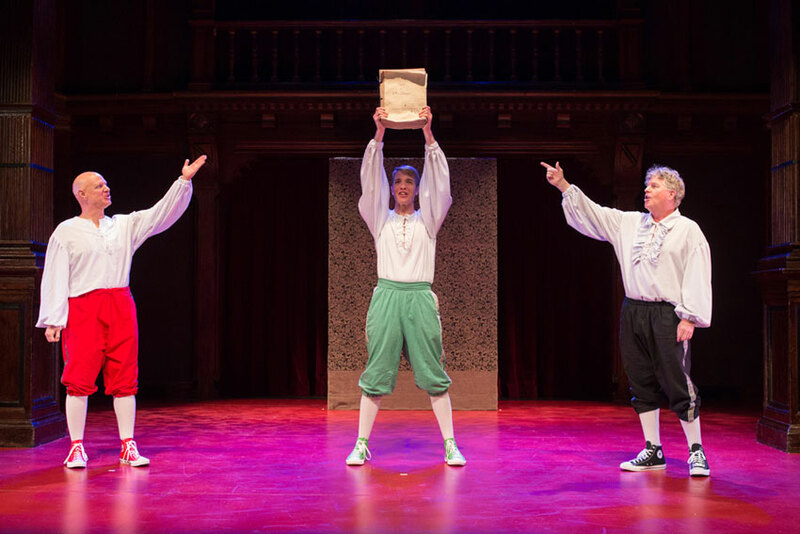 Reed Martin, Teddy Spencer, and Austin Tichenor in William Shakespeare’s Long Lost First Play (abridged) at Folger Theatre, 2016. Photo by Teresa Wood. During a tour of the Folger Shakespeare Library vaults back in 2010, my wife asked our hosts what they hoped the lost treasure would be in some fictional Shakespeare-themed Da Vinci Code-type mystery. Associate librarian and head of reference Georgianna Ziegler offered, “My holy grail would be to find an actual manuscript of a Shakespeare play, in his hand.” The Folger’s then-director Gail Kern Paster agreed. “That would be soo cool!” she said. The light bulb went on immediately: Since the discovery of such a precious artifact seems unlikely (though not impossible), we decided we should create one instead. Thus was born William Shakespeare’s Long Lost First Play (abridged), written by me and my Reduced Shakespeare Company partner Reed Martin, and just recently published in both the US and the UK. Our concept was that seventeen-year-old Shakespeare, a young man bursting with creative genius but little experience or craft, created a massive work stuffed with almost every character and famous speech from his ensuing canon. Realizing the result would be impossible to stage, and that most of it was in rhyming iambic pentameter (clearly the mark of a very immature playwright), Shakespeare would “bury it certain fathoms in the earth” — in a parking lot in Leicester, next to some bones that didn’t look that important. With 1,639 characters and a textual declaration that it will encompass “the one hundred hours traffic of our stage,” this first play was clearly never meant to be performed, which meant that we would have to edit it down to a manageable two-hour running time. We focused on the “merry war” and “ancient grudge” between the magical creatures Puck and Ariel, whose supernatural rivalry creates a Sorcerer’s Apprentice-level of chaos, throwing familiar characters we know from Shakespeare’s later work into strange and unexpected combinations, such as Lady Macbeth spurring her fiancé Hamlet into action, Cleopatra wooing the rustic player Bottom, the three weird sisters from Macbeth disappointing their father King Lear, and Dromio (from The Comedy of Errors) fleeing Juliet. Austin Tichenor as Richard III in William Shakespeare’s Long Lost First Play (abridged) at Folger Theatre, 2016. Photo by Teresa Wood. Beatrice, in much the same way as Shakespeare subsequently depicts her later in Much Ado About Nothing, suffers no fools and agrees that “gentlemen are not in [her] books.” When a mighty tempest forces all the characters onto a wooded island, Beatrice develops passionate feelings for Kate from Padua, and they pursue romantic options the young Shakespeare wasn’t aware he couldn’t write about in the late 1500s. The scene with Beatrice and Kate, like the scenes with Hamlet and Lady Macbeth, explore wonderful alternative readings of the original source material, allowing audiences to speculate what might have been possible if these famous characters had been given different circumstances or created in different times. There’s comic delight, too, in imagining what would have happened if Shakespeare had been so naive as to create scenarios that would have gotten him into so much trouble. Folger Theatre’s decision to produce the world premiere of William Shakespeare’s Long Lost First Play (abridged) in 2016 brought a wonderful close to the script’s development process, seeing how the idea was born downstairs in the Folger vaults. We were obviously thrilled to be part of the international hoopla surrounding the 400th anniversary of Shakespeare’s death, but there was additional resonance in that 2016 was also the 35th anniversary of the first performance of the Reduced Shakespeare Company at a Renaissance fair in Novato, California, in 1981. It was a wonderfully appropriate time to return to our Shakespearean roots, after years of reducing other large topics like American history, all the great books, and the Bible. 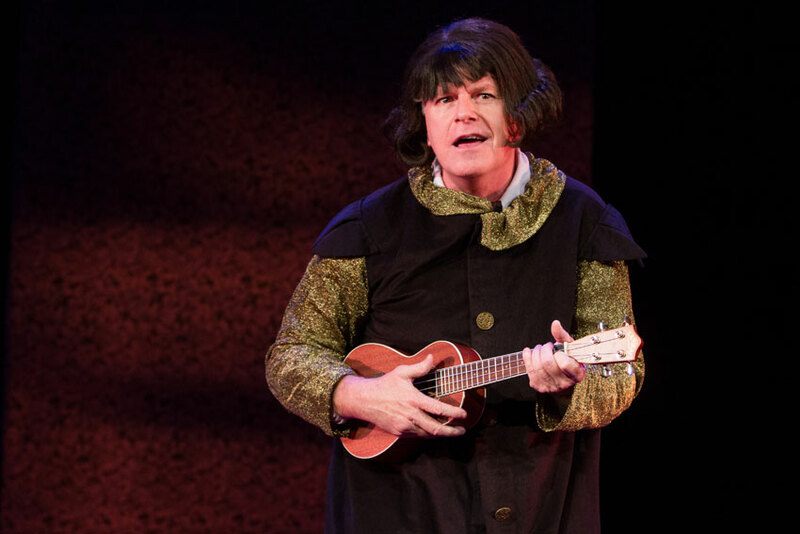 We were also conscious to showcase the many Shakespearean characters not featured in the RSC’s first show The Complete Works of William Shakespeare (abridged), (written by Adam Long, Daniel Singer, and Jess Winfield) — especially the female ones. Our scripts are frequently licensed by high schools and colleges — the theatre departments of which traditionally have more women than men — and we knew it would be a wonderful opportunity for those students to dip their toes into such fantastic female characters as Ariel, Viola, Beatrice, Lady Macbeth, Cleopatra, Kate, Juliet, Mistress Quickly, Regan, Goneril, Cordelia, and the Weird Sisters — all in one show. There has been one significant critical misunderstanding, however, and it needs clarification. Even the rave reviews have mentioned our alleged punning (“A pun-filled romp!” declared the Washington Post). We beg to differ: These are not puns — these are first-draft scribblings of a young playwright developing his voice! The more seasoned Shakespeare would realize later there’s a better, briefer way to say, “The important thing about brevity is that the use of it can frequently take the appearance if not the substance of the soul of wit.” Seventeen-year-old Shakespeare clearly loved Falstaff’s entrance line “A whore, a whore! My kingdom for a whore!” but it was older, wiser Shakespeare who realized that line could be repurposed in a more dignified and thrilling way in Richard III. “I come to marry Kate, not to seize her” is not a pun, it’s a rough draft line Shakespeare later dusted off for his rhetorically rich “Friends, Romans, countrymen” speech in Julius Caesar. If anything, it was the more sage and savvy Shakespeare himself making puns on his early work! We demand retractions. The good news: Since William Shakespeare’s Long Lost First Play (abridged) is a two-hour abridgment of a 100-hour-long play, that means there are possibly 49 other two-hour reductions that can be carved out of this massive source. So maybe, fingers crossed, there’ll be sequels! * Stay tuned. * That was meant as a promise; we apologize if it sounds like a threat.